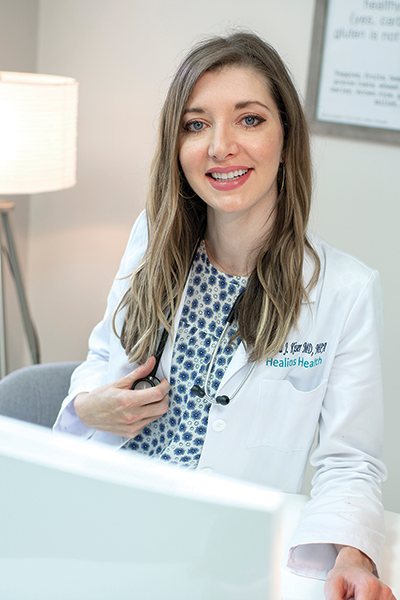 Dr. Starla Kiser opened Healios Health Center in Wise County last December with the goal of making health care more affordable and accessible, especially for patients without insurance or with high-deductible plans. “What the model is based on is simple: a patient and a doctor trying to get back to the way health care used to be,” she says. Kiser started the clinic with her own funds but recently received a $10,000 grant from the Virginia Coalfield Economic Development Authority (VCEDA). She is using the money to remodel the clinic and buy computers and tablets to be used for check-in. Instead of paying for each doctor visit, Healios patients pay a set monthly fee. Patients under the age of 60, for example, pay $65 a month to become a member. “That’s pretty reasonable,” Kiser says, noting that fee also includes in-office tests such as a urinalysis. Members can see the doctor as often as needed during the month and have 24/7 access as well. The health center’s app provides virtual visits, and patients can also text Kiser if they have urgent health needs. A native of Dickenson County, Kiser has a medical degree and a master’s degree in public administration from Harvard University. In choosing a site for her practice, she decided it should be “in the community I know the most about,” she says. Southwest Virginia has been identified as one of several rural areas of Virginia that need more health-care providers. The grant Healios received is one of 12 awarded in April by VCEDA to businesses in Wise, Scott, Tazewell, Dickenson and Russell counties. Ten grants were for $10,000; one was for $5,000; and another was for $4,500. “Through our new Seed Capital Matching Grant program, the Virginia Coalfield Economic Development Authority is supporting the creation of new small businesses in our region, which we feel is a very important part of the overall economic development strategy for revitalizing the economy of the coalfield region,” says Jonathan Belcher, VCEDA’s executive director/general counsel. Kiser would like to cap membership at her clinic at 300 to 400 patients. “I’m not yet at that number. I am still definitely open to new patients,” she says.